I guess you can call it that…but it is such an understatement. It is so much more than that…so much better than that description indicates. In fact, I worry that my own words will not do it justice either. You must must go for yourself…but in the meantime, let me tell you nearly a dozen reasons everyone in our family LOVES Anakeesta! THE CHONDOLA. 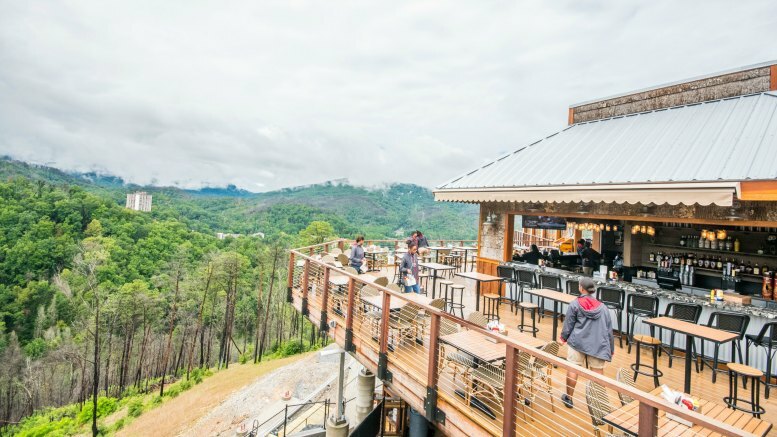 You get to Anakeesta from main street in Gatlinburg, right across the street from aquarium… but it sits on top of the mountain high above the city. To get to the top, you ride the chondola….it’s a chair/gondola like you’d take when skiing. Each seat holds 4, with a security bar and I felt perfectly safe with my boys. They loved it, in fact, and we saw a momma and baby bear below us (in the forest) as we climbed! If that makes you nervous, or it just doesn’t work for you, there are also two gondolas you can step into for the ride. They come every 7 minutes. Here’s the coolest part – if you have a ticket to Anakeesta, you can ride the chondola up and down as much as you’d like. Read on to find out why this is even better than you think. Don’t forget to smile for the camera! You’ll want a photo climbing up the chondola, for sure! THE BEST VIEWS AROUND. We were lucky to have a special tour from one of the owners, who told us that they first procured this land before the wildfires of 2016. At that time, the views were nice…but there were plans to build an observation tower to take you over the tree-level to see the amazing view. With the advent of the fire, the top of the mountain lost a ton of trees. Of course, it was devastating to everyone. The silver lining, though, is that the clearing made it easy to see the surrounding mountain-scape no matter where you stand. In the early morning when we visited, the mountains were embracing their name…the “smoky” mist obscuring the vista it bits and pieces. By afternoon, the mist had cleared, and the views were pristine for miles and miles and miles. And remember how I said you could come back up again and again, if you’d like? Sunset is the perfect thing to bring you back here. Dine at Cliff Top and then enjoy an after-dinner cocktail as you watch the sun set. It’s unbeatable. In fact, the west-facing deck is called The Sunset Deck. IMPECCIBLE EATS. There are three awesome ways to eat here. If you’re looking for something casual, then consider Smokehouse. It’s a food truck on top the mountain, serving delicious BBQ. The smells coming from the smoker will set your tummy growling early in the morning! And the picnic tables there offer fantastic views to match your sandwich. For a few more choices, or a sit-down meal (with a full bar!) then try Cliff Top. You’ll love the salads, burgers and kids’ selections. It’s all “outside” dining, but under a giant roof….so it’s like the best of both worlds. Finally, to satisfy your sweet-tooth, try a slice of pie or ice cream from Pearl’s! THE CANOPY WALK. This was my personal favorite! A boardwalk-style walkway connects winds you through the trees on such a peaceful and relaxing walk. You’ll see a few zipliners overhead, but it’s mostly quiet and serene…and high in the trees. ZIPLINING (WITH A BONUS). Yes, I did mention ziplining! We didn’t partake, since the boys are not yet 70lbs….but we did watch other tree-swingers, and they seemed to love it. Anakeesta offers “dueling” ziplines, so you can challenge your friend to a flight to the finish! There are 4 stations, with the last one ending at the mid-point of the chondola…so you can catch it back up and easily go again! Here is the coolest thing, I think….from two of the stations, you land on an upper deck in the tree….and then repel down to the lower deck to head to the next station….is that not AWESOME! What a cool ziplining bonus! THE PLAYGROUND. The boys and I fell head over heels for this playground. The wood is knotted and twisted, and all-natural. I love the climbing, tunneling, winding paths through the houses. There are rope bridges and lookouts…even a bird’s nest. VISTA GARDENS. Ok, can I have multiple favorite places? The winding vista gardens was previously filled with trees – prior to the fire. So the owners, with their amazingly talented landscaping background, put this space to work as a high-point garden. You’ll find a walking trail, spectacular art like the arch the boys are posing in, a gnomes house, ideal selfie-spots….and bright, fun plants and flowers. THE COMING MOUNTAIN RAIL RUNNER. Opening in Fall 2018 is the new Mountain Coaster! It will start at the top of Anakeesta and take you on a winding journey down the mountain. What I think is so special about this coaster is that it has a first-of-its-kind in the US single rail system. It is so un-intrusive! Your views of the mountain from ON the coaster and as you watch the mountain side are not obscured by lots of winding metal. It’s fun, while still being respectful of the environment! SHOPS YOU’LL LOVE. Catching Fireflies is the sweetest store, with a true appreciation for the natural wonder of Anakeesta. You’ll find gifts and souvenirs that offer the same sweet feeling that Anakeesta provides, as a whole. My favorite here is the tree in the middle of the store that changes branches with the season! The Great Outdoors Trading Company sells outdoor-centric merchandise that nature-lovers will adore, including art peices from local and visiting artists. We loved the photography here! Adventure Outpost is where we secured our beloved Anakeesta gear…I’m wearing my shirt as I type this! It’s also where you’ll get you tickets for the zipline! Get a ticket early in the morning, and it’s good for the whole day. If you happen to get a ticket after 6pm, then no worries – you can come the next day for free! And if you fall in love with it like we did, you’ll probably want to visit more than once. For less than two tickets, you can get an annual membership. Sweet deal – especially since something new is opening up here almost every season! SEASONAL ACTIVITIES. Keep an eye on their calendar, as there are seasonal activities. For summer we enjoyed s’mores in the evening and live music…plus free activities for the kids on select days. Things like making a birdhouse are super ways to keep the kids engaged. Gatlinburg is a tale of two cities. There is the downtown area, filled with restaurants, attractions, lights and excitement. Then there is the Great Smoky Mountain National Park – serene and peaceful, with Mother Nature as the only show in town. Anakeesta, in my mind, is the perfect middle ground. 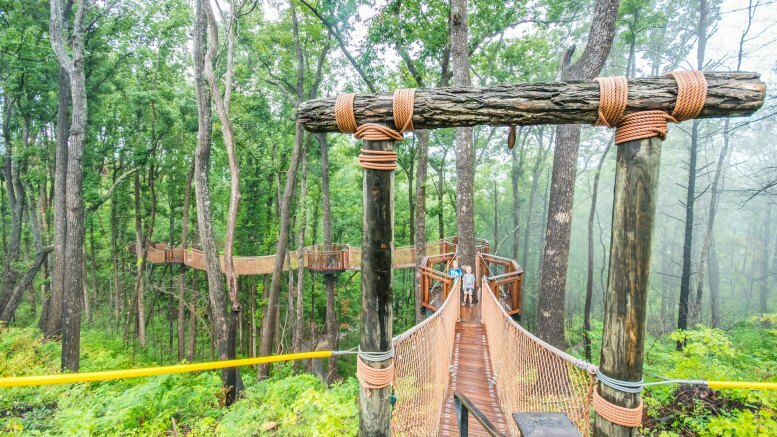 It shows off the FUN that Gatlinburg offers, while still paying homage to the surroundings. It’s pretty close to perfect. 365 Daily posts are short and sweet, designed to highlight the discoveries we unearth on a daily basis as we explore Atlanta, the South, and the world! Thank you to Gatlinburg and Anakeesta for hosting us. We are truly honored to have experienced this oasis. Be the first to comment on "Anakeesta: Gatlinburg’s Newest Attraction Is What Dreams Are Made Of"